What did the USC do? Because the Academic Building is not on route for most students and we understand that not everyone enjoys spending three and a half hours in a meeting, we decided to write you a small summary of what we discussed in the meeting. Last Monday, February 4th, we had a meeting with the University Board (College van Bestuur, CvB), the Employee Council (Ondernemersraad, OR) and ourselves, the USC. This meeting is called the Joint Assembly (JA, also see title of this article). In short, we discussed the following things. First, and maybe most often mentioned in the media, was the language policy document. It states that every new, first-year student should do a language test when they start a bachelors’ at our university. The board stated explicitly that the goal is not to teach spelling, but to test the academic language level. What exactly that entails, was not entirely clear yet. Also, the consequences of not passing the test are also still being discussed within Berchmanianum (the building behind Erasmus, where all policies come into making), so to be continued… Our point of view: it shouldn’t become another things students have to do; there is enough on their plates already. We also discussed student organizations and internationalization: a lot of organizations are trying to become more international, but it is simply not so easy. Most don’t know where to start and what works and what does not. Therefore, we will keep working on getting more help from the university on this subject. We also started a discussion on the board certificate. This is a certificate that board members can get if they do a board year here, according to the studentenstatuut. If you are currently doing a board and are thinking “huh, I never heard of that,” then you are definitely not the only one. The university board has promised to make sure that students can apply for the certificate again. That this is a possibility will be included in the email to new board members every year. As always, we discussed sustainability and the green campus; from (non-)recyclable coffee cups to water tap points, it all passed the revue. If you have a good, green idea, come to us or the Green Office. We can both be found in TvA1. We should not forget to mention that the results of the research on the effects of the BSA are public. As a reaction to that, we wrote a note on how we would like to change the BSA. Our note and the results of the research project will be taken into account to form a new vision on the BSA. We also discussed the preliminary evaluation of the pilot Flexible Studying (no English link available :( ). In this pilot, students having a child, doing top level sports or doing a board year, can get more flexibility in their education. This way, it should be more manageable to combine these things. This is great, but it turns out that it is not working on every faculty as well as one would hope. From the evaluation, several points emerged on how to improve on this. We hope that these things will be improved upon in the remaining year and a half of the pilot. 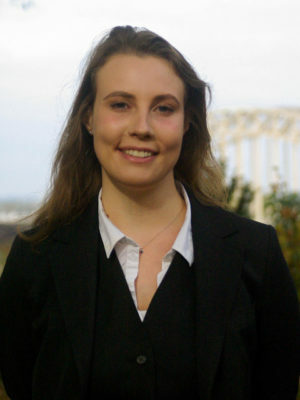 My name is Savannah Mellendijk, I am 22 years old and a history student at Radboud University. Next year I will be a member of the University Student Council as political chair of the Collaboration Consultation Faculty Associations, an umbrella for the study associations of the university. As a political chair, next year I will represent their interests at the highest level of employee participation. History is my greatest passion, and last year I was also delighted to be the chair of the History Study Association Excalibur. In the coming year I hope to use my experience as a board member, supplemented with the critical gaze of a historian, as a representative of the study associations. I also want to dedicate myself to the active student and to reduce the distance between study associations and university. As a University Student Council we would like to improve the university, but we do not do this alone. I am always open to new ideas and a good conversation! My name is Lara Mascini and this year I will be a member of the University Student Council (USR) on behalf of the B.O.S., the umbrella organization of the Nijmegen student associations. I myself started at the Business Management Master Organizational Design and Development. It is important to me that students have the opportunity to develop on a personal level in addition to ‘studying’. That is why I will commit myself this year, among other things, to the Active Student, so that students can have fun during their student days, find out where their ambitions lie and build up a valuable network for the rest of their lives. In this way I hope that the emphasis will be more on ‘being a student’. Finally, your student time is the most beautiful time of your life! Do you have suggestions how this can be made possible or do you have other ideas? Then contact me! I am Xander van Ulsen, student public administration and this year I will be part of the University Student Council on behalf of student party asap, for which I will be party leader. Last year I was board member of Start Up Mix Students and tried to aid enterprising students in the realization of their ambitions. I became more aware that there are so many more options than just studying at the university. This year, I will work towards an increase of the possibilities for active students, in the broadest sense of the term. Whether you are an entrepreneur, top athlete, carer or board member of a student organization, the university should prioritize personal development more than it does today. Sustainability will be another subject of my interest this year. I hope to see that sustainable options are more accessible for students. If you have any questions, you can always approach me or send an email to xandervanulsen@gmail.com. My name is Jessica Oudenampsen and this year I’m in the student council on behalf of asap. I’m in the fifth year of the study Medicine, and thus I’m in the middle of my internships. Last years I was participating in the co-determination at the Medical Faculty, both as a member of the education committee as well as student assessor. Now I found it was time for me to discover ‘the rest’ of Radboud University. This year in the student council, I would like to dedicate myself, in addition to the general tasks and subjects, to greater visibility of the co-determination, good study workplaces and the possibilities for interdisciplinary education. In addition, I think it is important that the Faculty of Medicine is less of an island. I hope I will be able to bring Radboud University and Radboudumc slightly more together in the coming year. We can learn a lot from each other. Do you have ideas for co-determination? Do you have issues that we as student council really need to address? I love coffee and beer so I really invite you to talk about it! I wish you a nice academic year and hopefully; see you soon!